if you would like to try running Gentoo in 64-bit mode on your Raspberry Pi 3, you might like to have a look at the updated bootable image I've just released, on GitHub, here. Update 10 March 2019: a new 1.4.1 release of the image is available; please see this post for more details. You can burn the image (~821MiB compressed) to a microSD card (>=8GB), then boot your RPi3 from it directly (the root partition will be automatically resized to fill the card on first boot). Full instructions for download and use are provided on the project's GitHub page. The image contains a complete (OpenRC-based) Gentoo system (including a full Portage tree, up-to-date as of 9 July 2017) - so you can run emerge operations immediately - and has a reasonably populated userland (Xfce v4.12, LibreOffice v5.3.4.2, Firefox v53.0.3, Thunderbird v52.2.0, VLC v2.2.6, GIMP v2.9.4 etc.) so that you can get productive without having to compile anything first (unless you want to, of course ^-^). Just download, xzcat to a microSD card, and boot! WiFi and Bluetooth both work, as does sound (via onboard headphone jack, and over HDMI). VC4 acceleration is supported via the mixed-mode vc4-fkms-v3d device-tree overlay / kernel module / Mesa driver, and performance seems reasonable (glxgears 400-1200fps, real-time video playback). The kernel on the image is 4.10.17-v8 from raspberrypi/linux, in pure bcmrpi3_defconfig form. There's also a (sticky) thread about this image on the Gentoo forums, here. PS this is an updated version of the image that RoyLongbottom used for his 64-bit benchmarks (see this post). For those with significant amounts of work invested in the 1.0.2 image, manual upgrade instructions are also available, here. Last edited by sakaki on Sun Mar 10, 2019 4:13 pm, edited 4 times in total. 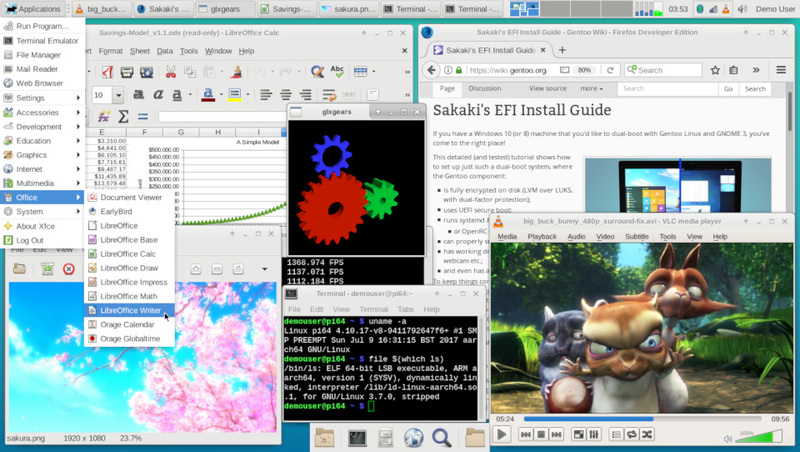 http://murga-linux.com/puppy/viewtopic. ... 128#961128 as well. Olle2 wrote: Thanks! Great work. support for playing HDMI audio via any installed pitopSPEAKER units. There's a 64-bit version of Gordon Henderson's handy wiringpi library (and gpio utility) included on the image too (my ebuild for this may be found here), as the above drivers need it to operate. Full details of how to download and use the variant image (and the vanilla RPi3 version too, of course) are available on the project's page on GitHub, here. 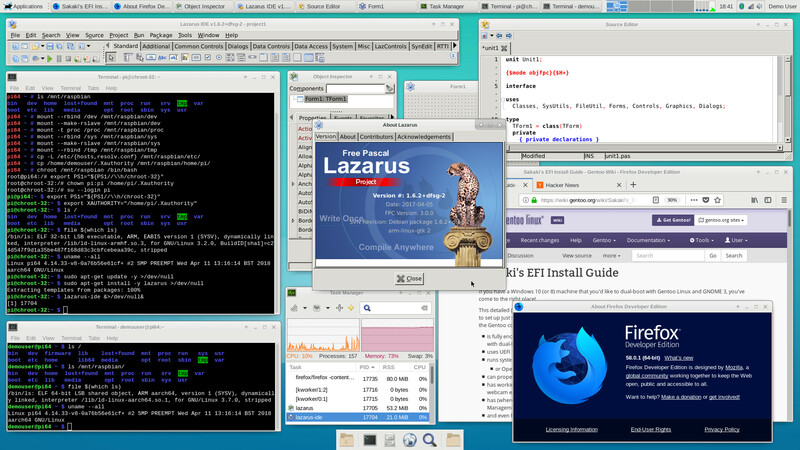 As with the standard version, it boots to an Xfce4 desktop; there's nothing to configure or compile if you just want to play around with it. 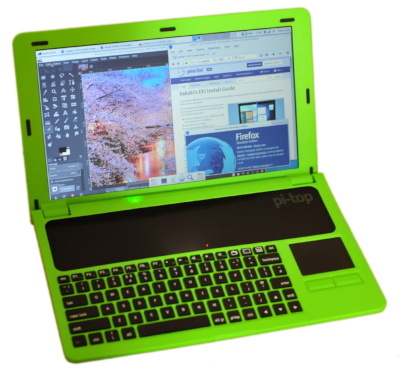 Both of these 64-bit versions of Gentoo (for the RPi3 and for the PiTop) are now easily installed via PINN. Thanks to sakaki for helping accomplish this. Version 1.2.1 of this bootable 64-bit Gentoo image is now available on GitHub (here). The RPi3 B+ is now fully supported (and the RPi3 B remains supported too, of course). All packages have been brought up to date against the Gentoo tree as of 31 March 2018 (so e.g. Firefox Quantum is included, which is quite a lot faster than the old browser). I believe the image will also be available shortly via PINN, courtesy of procount. Gentoo64 v1.2.1 is now available for install through PINN. Wow! Thank you so much for this! To make it friendlier to new Gentoo users an easier way to change region settings would be nice. Lucky that can be changed from Desktop setting manager as it makes it easier to edit the rest of the files. WiFi is important to set before using it. The X11 is running Mesa recompiled for Aarch64. So that means the 32bit userland apps like raspistill/vid won't work? Can 3 cores run in Aarch64 and the last core run in Aarch32 and talk to these 32bit apps? Alternatively raspiraw does not use the VC4 ISP so it could be compiled in 64 bit and then all the camera stuff tweaked in NEON. Not for normal camera use ie jpeg/h.264 but for computer vision. Gavinmc42 wrote: To make it friendlier to new Gentoo users an easier way to change region settings would be nice. Yes, the settings are all UK initially, as noted in the readme; keyboard and other locale stuff can be changed via the GUI, but I do need to build a little app to prompt for the WiFi regulatory domain using a drop-down list, and present that on first boot, with the WiFi locked until it is specified. At the moment, you can set the domain (per the release instructions and readme) via /etc/conf.d/rpi3-wifi-regdom, but the process should be simplified. On my list for the next release. Gavinmc42 wrote: Can 3 cores run in Aarch64 and the last core run in Aarch32 and talk to these 32bit apps? Gavinmc42 wrote: So that means the 32bit userland apps like raspistill/vid won't work? Also (and this may have changed since the last time I checked, if so I'd really like to know so I can add it in! ), some features on the RPi3 which require MMAX or OpenMax IL are unavailable currently when booted in 64-bit mode, regardless of whether the particular userspace client is 32-bit or 64-bit. So OMXplayer won't work either? no big deal. I did notice the browser is written in Rust which means Neddyseagoon? got the 64 bit Rust compiler working? This looks to be using some multicore code from Mozilla's servo engine? Wonder how many tabs can be open, Raspbian Chromium gets flaky at about 6 tabs. Hmm, Rust only 1.23.0, might have to Rustup, some AVR support in new version. Wonder if Redox can be built on Pi's now? Would be interesting to try some Rust examples on 32 and 64 bit Pi's now. Once Go works, Docker follows? Was playing with Gentoo on Pi all weekend and all last night, apart from keyboard/mouse input lags it kept running fine. Not sure why key/mouse locks up screen for seconds but once that is fixed Gentoo is looking very usable. Great instructions on Sakaki's github, much easier than trying to find out how to do things on Gentoo's webpages. I suspect the new USB hub chip/s has issues when used as a boot drive. Ok upgraded USB stick to 4.14.34 and still got laggy response. It's worth mentioning that USB booting is still officially considered an experimental feature, isn't it? Checked old Pi3B it is also slow and laggy with same USB stick. Ok SD card is much faster and not laggy. Next test, try different USB stick, perhaps not elcheapo versions? Conclusion, do what Sakaki says and get a GOOD uSD card. should work on your machine, without any further installation. go is keyworded for ~arm64 on Gentoo, so I guess it can be built OK. I'll have a look at adding it to the maintained autobuild list, once rust finishes. As not everyone might be aware you can do this sort of thing on ARMv8, I'll post another note to that effect on this forum now. Thanks Sakaki, yet another comprehensive" how to" wiki. Makes me wonder what other 32bit things can run in Aarch64. Is swap drive running from USB when Gentoo boots from USB? Just wondering if that is causing the lagging? Raspbian boots slower but runs ok from USB. Others use various USB drives, harddrives/SSD etc. Yes, the image runs ships with a 512MiB swapfile on the root partition, for simplicity, so root on USB implies swap on USB. If running lots of open apps, and your storage is slow, you may experience a lag while the target app swaps some pages back in (probably what was happening there). Depending on your setup, a different swap configuration may produce better results. to see if that improves things. Remember that everything else equal, 64-bit apps will tend to have a larger object code footprint than 32-bit ones. There's a difference in the kernel too BTW, my autobuild for versions >= 4.14.33 are built with optimized KBUILD_CFLAGS (see this post), and anecdotally feel a bit 'snappier' to use (whereas the kernel shipped with the v1.2.1 image is a vanilla aarch64 build). With Ethernet up to 300Mbs via USB LAN7515 I am thinking a USB boot drive may not be a good idea. Likewise a USB swap drive could slow things down as everything has to go via that single USB port on the SoC. Other options is Gert's IDE via SMI, SPI memory etc. Because I want to develop IoT code on Pi I don't need to run the code on the same Pi, that leaves the GPIO header free for more memory. Swap file in SPI SRAM/FRAM? In theory the GPIO header and SMI can talk direct to parallel NAND flash and at a faster rate than the SPI based SD cards. Google time, has it been done? Just wanted to say thanks for the folks making this Gentoo build happen. Been using Gentoo as my primary OS since doing a Stage 1 of 2004.3 back in college, and had always wanted to give it a go on a RPi. Finally picked up a Pi 3B and Gentoo 64 is running great. Got the Arm Compute Library for 64bit NEON fun and games, needs something called scons 2.3 or above. Apt-get install works on Debian. Starting to think there is only three OS's in the world Windows/OS X/Debian. [email protected] ~/ComputeLibrary-18.03 $ nice -n 19 scons Werror=1 -j2 neon=1 opencl=0 gles_compute=1 arch="arm64-v8a" build=native extra_cxx_flags="-mtune=cortex-a53"
Building your own copy gives the advantage of being able to optimize the code directly for the cortex-a53, and also to use the gles_compute shader support, which you should be able to exploit given the image uses vc4-fkms-v3d / Mesa. This download and build process could easily be turned into a ebuild incidentally. Thanks Sakaki, more useful posting. Watching the screen scrolling up now. Those Opengles-3.1 examples probably won't work? I think I might have to get some more Pi3B+ and setup a compiler farm. Got so much 64bit stuff I want to try now. What setup do you use? Pi3B+ can get 300Mbs over Ethernet, is that faster than SD/USD drive speeds? Network storage instead on local? Hmm network swap file, nope probably better to go headless? No GPU (16MB) memory and use the saved memory as swap? Going to be interesting to see if Aarch64 is much better than 32bit for these ARM Compute examples. Not many benchmarks yet with this new Pi3B+ in Aarch64. Oh, forgot, no temperature display in the panel applets, I used to watch that in the Pi3B's, good indicator of stress. Might try the VC4 OpenCL stuff now. I did notice LLVM 6 is installed, perhaps get SPIRV-LLVM working too. Aarch64 - just doubled what I have to learn, probably take another 6 years. Crashed and burned, went out after a hour, had error when I got back. But if it compiled the Compute library and ran for an hour+, then it will probably compile parts of it. Did you get yours to compile? If so I will need to configure my systems the same way. Need to build up better system and perhaps headless version, lucky I get my Pi's in pairs, time to open other box. Got 120GB SSD that might work but Etcher does not recognise it as removable -- yet . Using my fastest 32GB Lexar USB stick at the moment, le d blinking away when nothing is happening. It indicates to me lot of stuff going on. SD cards have new rating A1 scheme. When running apps from SD cards in Smartphones it can handle the small read and writes. This means I probably need to upgrade a few phones and tablets around here too. What is CONFIGURATION FILES UPDATE TOOLS? 4 config files in '/etc/portage' need updating. Where is the emerge man page hiding? Pi has gone into upgrade mode - 1 of 59 jobs. Just guessing but is this the once a week updating, midnight Saturday nights? Yes, this is a cron.weekly genup job. If you want to turn it off, see these instructions in the readme. The way things are set up, it should really only be trying to upgrade things for which pre-built binary packages exist on the binhost (unless you have been doing a lot of USE flag changes etc. locally!) so the upgrade time isn't usually onerous (1-2 hours or so) even when big things like gcc or libreoffice are getting revbumped. Gavinmc42 wrote: Crashed and burned, went out after a hour, had error when I got back. Yes, the ARM Compute Library compiled fine for me with the flags given, and I was also able to run the example neon program I posted above without error. You could try it again with -j1 (I was building on a headless box). Gavinmc42 wrote: I think I might have to get some more Pi3B+ and setup a compiler farm. I use swap and root on the SD card, and an overlay mount for /var/tmp/portage (where all the build action happens) on USB stick, in an attempt to maximize bandwidth (separate busses). Also, the RPi3B+ is set up as a distcc client, with a crossdev PC as the server. I have notes on how to set this up in the project's wiki. Gavinmc42 wrote: Pi3B+ can get 300Mbs over Ethernet, is that faster than SD/USD drive speeds? Funnily enough I did try swap over NFS onto an exported ramdisk of a PC on the same network. I actually had good success with this approach before, with another embedded board which had a (real) Gigabit Ethernet, but lousy on-board storage. It did create an additional point of failure and NFS wasn't perhaps the ideal transport, but I have to say it was pretty quick. Gavinmc42 wrote: What is CONFIGURATION FILES UPDATE TOOLS? Portage does not directly overwrite configuration files on an update. Instead, it writes a 'shadow' copy, and expects you to decide what to do about each one. There's a tool, called dispatch-conf, that you run (as root) to do this. I have some notes about using it here. Gavinmc42 wrote: Oh, forgot, no temperature display in the panel applets, I used to watch that in the Pi3B's, good indicator of stress. I have no idea why Gentoo has not called Aarch64 stable yet? That Porthole/portage stuff is not beginner friendly, click the wrong thing and a 1-2hour rebuild starts. Found the CPU freq applet this morning. Just realised I have two old Pi3B's now sitting idle. I can set them up for headless compiling, once I get more power supplies and more A1 rated SD cards. Is Midnight Commander in the ebuilds? It is my default remote SSH file manager/editor. Ok, now running headless and MC is in apps-misc/mc. Lots more memory free now and I am coming to terms with emerge. 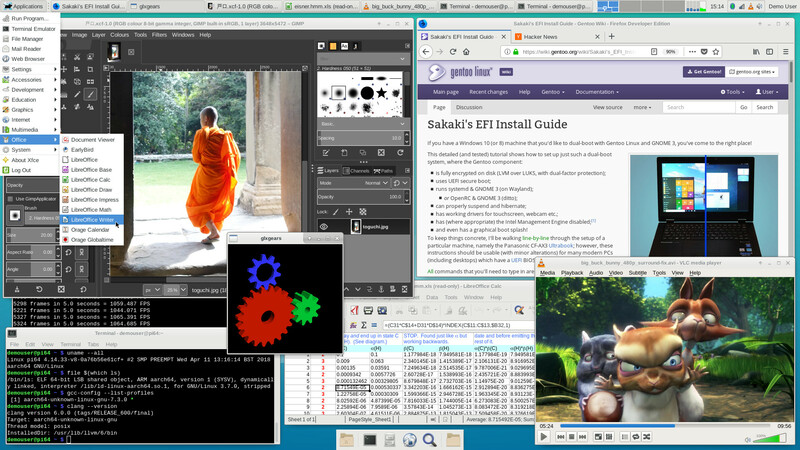 Thanks for all the help Sakaki in making the transition to Gentoo painless.